Stephen Sondheim's take on some of the traditional tales told to children is altogether darker but maybe not quite so dark as the Brothers Grimm whose Wicked Queen in Snow White was made to dance forever in red hot iron shoes until she dropped down dead. The Fiasco Theatre production from New Jersey, has an economy and intimacy which gives extra comedy and we enjoy the quick changes of costume and role. As the central tale is of the Baker (Ben Steinfeld) and his Wife being childless, an explanation is offered as to the actor Jesse Austrian's real life pregnancy lest we get confused. The Wolf (Noah Brady) doubles as a handsome prince, an interesting parallel as post his marriage to Cinderella (Claire Karpen), the Prince doesn't turn out to be the perfect husband but a love rat. In one of the early Red Riding Hood stories, the wolf was a child molester rather than just a granny eater. Sondheim's music can be difficult for those uninitiated with its sudden chromatic shifts and elements of atonality but his lyrics are to die for. As Simon Saltzman found in New Jersey (see the link below) the diction from the Fiasco team is superb and no joke goes unappreciated. An example of a great pun, "If the end is right, it justifies the beans!" In addition, this stripped back production doesn't have the full orchestra. with eleven (yes one more than in America) actor-musicians playing individual instruments, although the pianist and the cellist are almost always on their instruments. The ugly sisters (Noah Brady and Andy Grotelueschen) use the divided curtain rail to become Cinderella's ugly sisters Florinda and Lucinda. Andy Grotelueschen doubles as Jack's woeful cow with the additional of a cowbell but when he speaks he sounds exactly like Kelsey Grammer. These two actors become princes, one Cinderella's prince and the other Rapunzel's and their song "Agony" with its lovely melody celebrates the desire for what you can't reach. I loved the expressive features of Jessie Austrian as the Baker's Wife and of course in the Chocolate Factory, every seat is a good one. Vanessa Reseland's ugly witch with the beautiful voice metamorphoses into an elegant blonde beauty in long velvet cloak and high boots but all this beauty takes away her magical powers. As the ugly witch her listing of the greens lusted after by the Baker's mother is superb. Who else but Sondheim could get arugula into a lyric? The set is framed by piano parts, keyboards and piano insides and to the rear, the woods are densely layered ropes which look like tree trunks when someone passes behind through them. The assorted chandeliers hang with a pretty light for some magic. The first act has a seeming finality to it but the audience will come back for more and the frailties of human nature are revealed as Sondheim examines whether when we get what we want, will that be enough? The prince has a fling with Baker's Wife and then wriggles out of the commitment he has made by saying, "This was just a moment". When challenged by Cinderella, his punch line is, "I was raised to be charming, not sincere!" The final act sees the blame game in full flow as they try to find out who might be at fault for waking the destruction of the Giant's Wife in the finger pointing "Your Fault" and the dramatic "Last Midnight". Into the Woods restores the grimmer aspects of the Grimm Brothers' Tales and some detail lost in the Disney translations. For instance who knows that Cinderella went to a festival on three successive nights, not a ball, and of course there was no fairy godmother? The ensemble characterisations are superb, the not super bright but kindly Jack (Paul Mulryan) and Rapunzel (Emily Young) damaged by her isolation in that tower. Fiasco's production of Into the Woods makes up in intelligence what it doesn't have in Big Broadway accessories and for my money is all the better for it. 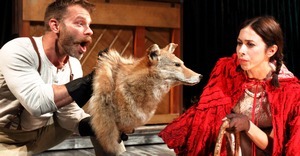 For Simon Saltzman's review of the Fiasco production of Into the Woods in 2013 in New Jersey go here. For Elyse Sommer's review of the New York production of Into the Woods in 2002 and the full song list go here.